This is the second year in a row McFadden has won the race. 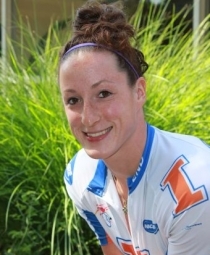 Tatyana McFadden of the University of Illinois has won the women's wheelchair race at the Boston Marathon for the second straight year. McFadden celebrated her 25th birthday Monday and listened as "The Star-Spangled Banner" played on Boylston Street one year after the bombings that left three dead and more than 260 injured. She crossed the finish line in 1 hour, 35 minutes, 6 seconds. McFadden was born in Russia and lived in an orphanage as a child. She also won the 2013 New York City Marathon women's wheelchair race after taking the titles in Boston, London and Chicago last year. No other athlete has won those four races in the same year.